For her Spring collection Joie de Vivre, Laura Mercier came out with three new shades of her highly pigmented, moisturizing lip color with the gorgeous satin matte finish. Velour Lovers Lip Colour is a revolution in matte lipstick. It couples delicate mattifying powders with moisturizing mango butter to create a velvety texture that is smooth, creamy and long-wearing. The formula is buildable, offering medium to high coverage with a matte, sateen finish. The three shades are: Happy, Joy and Smile. Happy is a sateen plum shade with a multi-colored micro shimmer. Joy is a gorgeous pop of purple with an iridescent blue-colored micro shimmer. 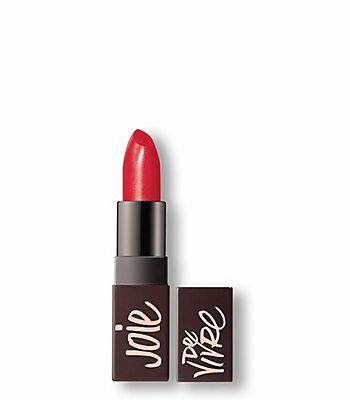 Smile is a happy poppy shade with a light micro shimmer of red. These are beautiful shades of the Velour Lovers Lip Colour, and this is one of my favorite formulas of lipstick. Below are swatches of all three shades so you can see them on skin and see how they look. Below that I will have a photo of me wearing one of the lipsticks. These lipsticks are very long-wearing, even though they are matte, they are not drying to the lips. That is why I like them so much. I find them fairly creamy feeling, non drying and extremely pigmented in color. This was all pretty much mentioned above but I wanted to give you my opinion. I also think that these lipsticks are buildable in coverage, you can add more coverage as you see fit. Laura Mercier Joie de Vivre Velour Lovers Lip Colour retail for $28.00. It can be purchased online at www.lauramercier.com, www.sephora.com, www.macys.com, www.bloomingdales.com. www.nordstrom.com, and any door where Laura Mercier is sold. Like Laura Mercier on Facebook: https://www.facebook.com/lauramerciercosmetics?ref=br_rs; Follow Laura Mercier on Twitter: @LauraMercier; Follow Laura Mercier on Pinterest: https://www.pinterest.com/lauramercierusa/ and Follow Laura Mercier on Instagram: https://instagram.com/lauramercier/?ref=badge.